In the spring, we asked library members to vote on three themes for the 2019 TD Summer Reading Club (TD SRC): “Game On,” “Amazing,” and “Natural World.” Our thanks to everyone who voted! In the narrowest of margins, “Natural World” emerged as the favourite theme for 2019. As usual, we wrote a creative brief to fully explore the meaning of the theme and to guide the creation of all program content. Below are the most pertinent sections of the creative brief. We are extremely pleased to announce that Clayton Hanmer has been hired to illustrate the 2019 program. Clayton’s illustrations will be featured on the print materials and the website for next year’s TD Summer Reading Club. Clayton (aka CTON) is an illustrator whose energetic comic style is featured throughout dozens of online and print magazines. He illustrated several books for children, including the award-winning Not Your Typical Book about the Environment and the upcoming Dog vs. Ultra Dog (Owlkids Books, 2019). He lives in Toronto, Canada, with his super awesome wife, amazing daughter and a weird cat named Graphite. The theme looks like one that will be easy to expand on in the library. 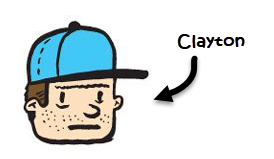 From the cartoon Clayton character above, I look forward to the illustrations on the print material.